We regret having to interrupt feel-good weekend articles with more sobering news. In Ukraine, major battles have broken out over the past couple weeks. 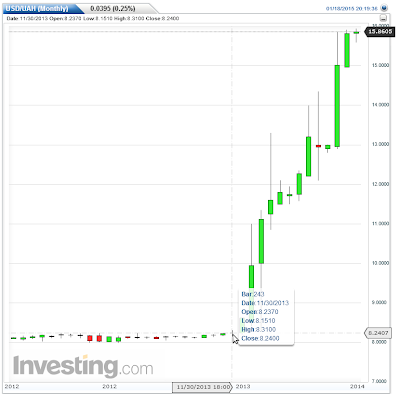 Mainstream media has widely ignored the story because of Greece, then Charlie, and then the Swiss Franc. And of course Western media has no interest in reporting news the rebels are winning. However, ignoring the story does not make it go away. On November 9, 2014, I posted Ukraine Split in Two; Expect Major Rebel Advance. That advance came later than I expected. But it is here in full force. Max Keiser provided this accurate headline two days ago: Ukraine Lurches to Full Scale War as Russia Drastically Reduces Gas Supply to EU. Reader Jacob Dreizin, a US citizen who speaks Russian and reads Ukrainian sent a few emails and videos recently worth posting. Here's a video that shows a military "cemetery" in Dnepropetrovsk region, Ukraine. Note especially seconds 33 through 51. There are literally hundreds of empty holes in the ground here, waiting for bodies. I read in another source that these graves were dug very recently, probably right before this video was posted on January 8th. Looks like Kiev had been planning an offensive, presumably the one that was just broken up by the rebels in the last few days. I guess it's cheaper to have the graves dug all at once than to keep calling the backhoe crew over and over. Link if video does not play: Mass Graves in Ukraine. The last few weeks have seen a significant escalation of fighting, which really boiled over in the last 5-6 days. I can't say for sure who "started" it, but it's clear from those hundreds of holes in the ground that the Ukrainians anticipated something. Dreizin also informs me that "The battle for the Donetsk airport is over. The rebels expelled Ukraine's most elite units from their last redoubts in the new terminal building." More reports coming up, none of them pretty for Kiev. Mainstream media ... silence. But some things are impossible to hide. Here's one of them. 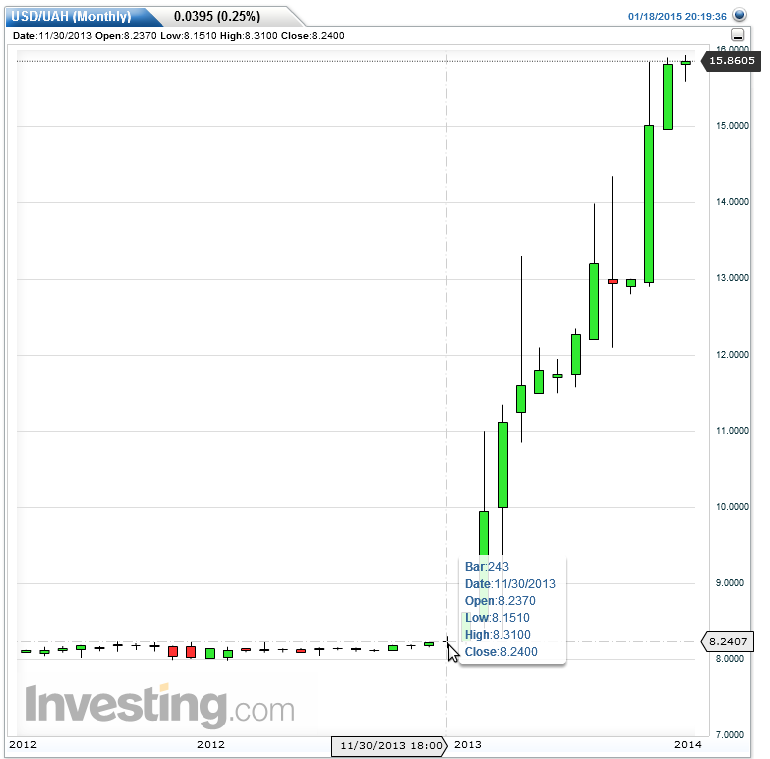 Since November 30, 2013, the Hryvnia has collapsed from 8.24-per-US$ to 15.86-per-US$. That's a decline of 48 percent. Everything Ukraine imports costs nearly double what it did just over a year ago! Ukraine is bankrupt. It needs another bailout, but so far there are no offers. See Ukraine Needs Second Bailout, Currency Reserves Drop to Critical Level; Another IMF Visit; Where's the Love? Ukraine's foreign currency reserves were down to just over $7.5 billion last year, the lowest level for 10 years and barely enough to cover five weeks of imports, pressured by external debt repayments including to the IMF and to Russia for gas. Repayment of $14 billion of external debt falling due in 2014 took its toll. From a "grave" perspective, the war marches on, and will do so until the IMF steps in with another bailout or every penny is gone, whichever comes first. Philosophically speaking, the war is actually over. Ukraine is already split in two even if international recognition of that event comes years later. The report from Dreizin that rebels took the airport was from Saturday. Reuters reported Sunday afternoon that Ukrainian troops retake most of Donetsk airport from rebels. With its runways pitted and cratered, Donetsk airport has long since ceased to function. But its control tower and extensive outbuildings, battered by shelling and gunfire, have taken on symbolic value, with government soldiers and separatists hunting each other, often at close range, in a deadly cat-and-mouse game among the ruins. What we don't know is "what costs" and to which side. Also, I strongly suspect that this surge for Kiev to the previous status quo may mean Ukraine forces are really thin somewhere else of more strategic importance, such as the area around Mariupol.